More programme information and activities details could be found on the HKU SPACE HPSHCC Food and Nutrition Facebook page. Graduates will be awarded Higher Diploma in Nutrition and Food Management. Graduates may continue their studies at degree level or enter the food or nutrition industries, pursue careers such as nutrition assistants, patient care assistants, food quality officers, health promotion and food safety management. 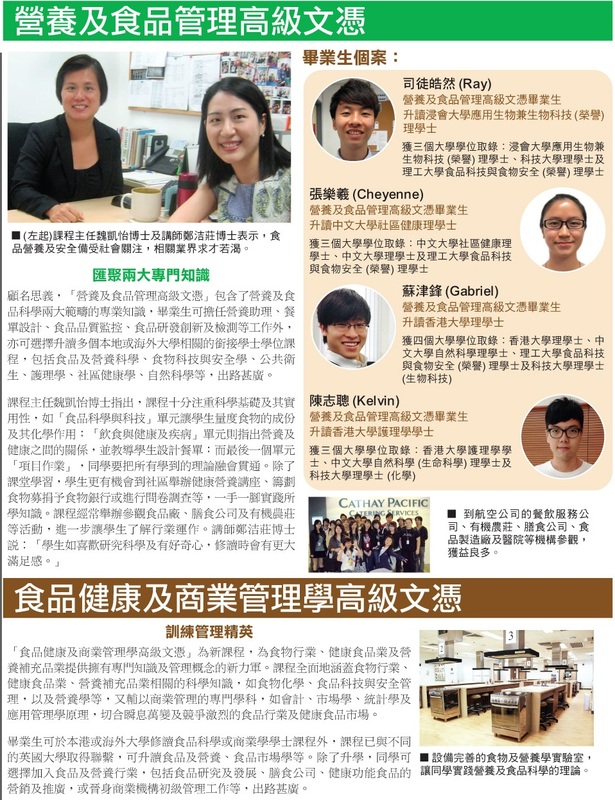 Graduates are eligible to apply for admission to Bachelor’s degree programmes in Food and Nutritional Science, Dietetics, Community Health, Biochemistry, Food Safety and Technology, Bioengineering, Exercise Science, Chemistry, Life Science, Gerontology, Health Education, Biology and Biotechnology offered by local universities (including HKU). Full-time, Bachelor of Technology / Advanced Diploma in Food Safety, Memorial University (Canada). ^This is an exempted course under the Non-local Higher and Professional Education (Regulation) Ordinance. It is a matter of discretion for individual employers to recognise any qualifications to which this course may lead. Graduates will have a range of career opportunities in the food, nutrition and catering industries such as health and nutrition-related commercial companies, food manufacturing, food trading, restaurants, airline caterers or institutional food service companies, school meal caterers, elderly homes, sport and health institutions, government agencies and hospitals. Applicants whose HKDSE results do not meet the entry requirements of the 2-year Higher Diploma Programme should apply for admission to the Diploma in Foundation Studies (DFS) programme. Applicants who do not possess the above academic qualifications, but are aged 21 or above and with relevant work experience will be considered on individual merit. #ApL Chinese (for non-Chinese speaking students) would be accepted as an alternative Chinese Language qualification. Apart from teaching the knowledge of nutritional science, the programme arranged various out-of-classroom activities for students such as visits to food processing industry, catering company and organic farm. We learned more about the operations of different companies. The experience was valuable.